While I hope you visit all of my sponsors (they pay the hosting, dns, etc. for the blog), I've added a spot for UNICEF's relief effort for the Tsunami victims. Update: Since UNICEF is so offensive to many of you, here's the list of organizations that are involved with the Tsunami disaster relief. And after reading Joe Katzman's latest on the UN's aid efforts, I'm pulling the ad. I just had thought that UNICEF was different (at least, the US contingent). Mrs. Blackfive and I had our first date nine years ago, and, of course, our first kiss was at midnight. So, New Year's Eve will always be special for us, and Chicago tends to have plenty to do on NYE. Folks, have fun, but remember...moderation, moderation, moderation. Amateur drinkers are out tonight and a lot of them will be dumb enough to drive. Uncle Ben sends these pictures of what might happen to you if you drink a little TOO much. Who Says Blackfive Doesn't Cat-Blog? Another MilBlog has been ordered to cease and desist...I'm sad to say that the 67th Combat Support Hospital Docs weblog has been shut down. While I'm no JAG, I didn't see any OPSEC violations or anything that would "embarrass" the Army. Probably, somewhere out there, some Colonel is worried that the 67th weblog will prevent him from being promoted to General. Really. I'm serious. BTW, I'm looking for *ahem* trends in the MilBlogs that are ordered to close up shop. If you know of any other recent closings, please email me. I first received this photo and was asked not to post it until it went through "Official Channels" (which is completely understandable). As many of you know, going through "Official Channels" usually means it will take forever or never happen. In this case however, it only took a few months...Click on the image to see larger version. Tech. Sgt. 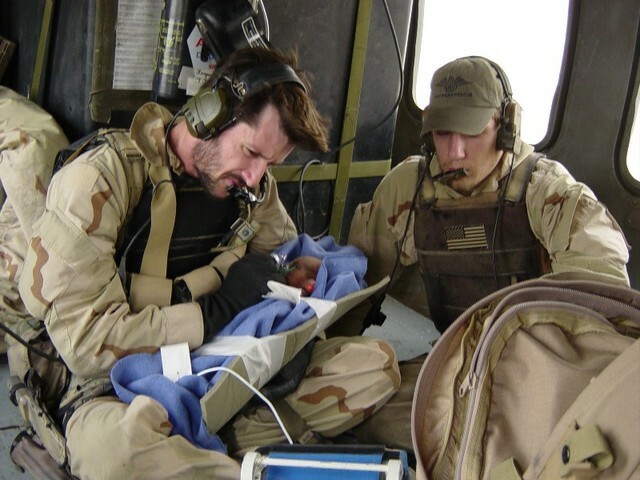 Matthew Wells, 48th Rescue Squadron, holds a baby as it is medically evacuated from Afghanistan on an HH-60. 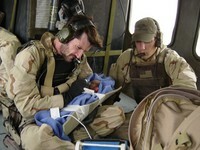 Senior Airman Sean McBride, 48th RQS, and Sergeant Wells check the baby's vitals on the monitor at their feet. Here is the link (PDF file - page 5) to the Air Force newsletter describing Sergeant Wells as the Air Force's representative in the Special Operations Medical Association's Medic of the Year Competition. To top off my son’s email he was able to call yesterday!!! I've just been in absolutely the BEST mood. Not only did he call, but we were able to talk for a long time and it was so wonderful. He shared so many stories and had my laughing so hard. 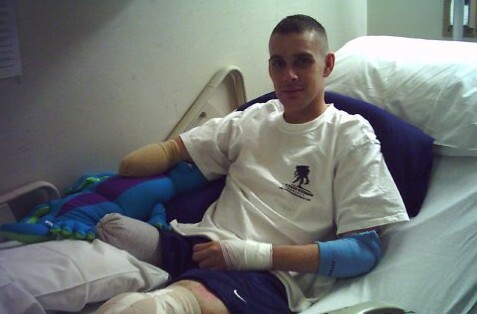 He wanted me to thank all his "Moms" and to let ya'll know that he and his fire team received their care packages and they were a wonderful morale booster. He said all of them had the Channel 11 footballs in their care package and they were out in the open area throwing the footballs around and other Marines were asking, "Hey where did ya'll get the footballs?" My son said at first they would all respond, "The Houston Marine Moms!". He said after awhile they were all laughing and they would just say "Our Moms". He said they call the footballs their WMD's. I asked why and he said that when the lights go out at night they all throw them really hard at each other and just have the best time. He was laughing so hard sharing these stories with me. He had me rolling. There's been a lot of developments with Sergeant Joseph Bozik. Below is an update from Joey's mother, Gail. 1. Last Monday, 27th, Joey's cast was removed on his left stump and two final pins removed from his left hand (total of 9). It was exactly 2 months to the day since the blast, Oct. 27th. 2. He has come a long ways in two months but he has a long road of therapy and more surgery on his left hand to remove the metal plate that is stabalizing his wrist which was crushed. 3. Today (December 30th), a nasty sore and reddness appeared on his left stump. Gail asked for Dr. Hampton to take and look but he was in surgery and didn't get time. Gail hopes and prays that it is not the Iraq bacteria returning. If so, that will mean more surgery. So please pray, pray! And Gail passes this message to all of you who have helped: "Keep praying and keep the candle lit. God Bless all you good people." Please go here for more information on how you can continue to support Joey, Gail, and Jayme while Joey recovers. No need to worry. I've gotten a few emails from some of you expressing concern that the Mudville Gazette was down. It was down, but not out. According to Mrs. Greyhawk, Mudville is just experiencing some server/hosting issues while moving the blog from one place to another. The site is up at the new host and it will take a little time to get comments, links, etc., working. For you military types, their old host changed the SP time on them and didn't give them the PIR needed to complete the mission. A guy gets time to think over here and I was thinking about all the support we get from home. Sometimes it's overwhelming. We get care packages at times faster than we can use them. There are boxes and boxes of toiletries and snacks lining the center of every tent; the generosity has been amazing. So, I was pondering the question: "Why do we have so much support?" In my opinion, it came down to one thing: . I think we learned a lesson, as a nation, that no matter what, you have to support the troops who are on the line, who are risking everything. We treated them so poorly back then. When they returned was even worse. The stories are nightmarish of what our returning warriors were subjected to. It is a national scar, a blemish on our country, an embarrassment to all of us. After , it had time to sink in. The guilt in our collective consciousness grew. It shamed us. However, we learned from our mistake. Somewhere during the late 1970's and into the 80's, we realized that we can't treat our warriors that way. So, starting during the Gulf War, when the first real opportunity arose to stand up and support the troops, we did. We did it to support our friends and family going off to war. But we also did it to right the wrongs from the era. We treated our troops like the heroes they were, acknowledged and celebrated their sacrifice, and rejoiced at their homecoming instead of spitting on them. And that support continues today for those of us in . Our country knows that it must support us and it does. The lesson was learned in and we are better because of it. Everyone who has gone before is a hero. They are celebrated in my heart. I think admirably of all those who have gone before me. From those who fought to establish this country in the late 1770's to those I serve with here in . They have all sacrificed to ensure our freedom. But when I get back, I'm going to make it a personal mission to specifically thank every Vietnam Vet I encounter for their sacrifice. Because if nothing else good came from that terrible war, one thing did. It was the lesson learned on how we treat our warriors. We as a country learned from our mistake and now treat our warriors as heroes, as we should. I am the beneficiary of their sacrifice. Not only for the freedom they, like veterans from other wars, ensured, but for how well our country now treats my fellow Marines and I. We are the beneficiaries of their sacrifice. Here's Amazon's preview clip (Windows Media Player). Late one night in St. Louis, I was feeding my four month old daughter and watching Country Music Television...something I don't have in Chicago...and Montgomery Gentry and Lynyrd Skynyrd were on CMT's Crossroads where the bands combine to play each other's songs. They wrapped up with "Red, White, and Blue" (lyrics). I rocked my baby girl to sleep to it. They absolutely rocked...Hopefully, they'll have Crossroads available on DVD sometime soon. On November 12th, 2004, Illinois Army National Guard Major Duckworth was piloting a Blackhawk over Iraq when it took Rocket Propelled Grenade (RPG) fire. WASHINGTON (12/27/2004) — Army National Guard officer Ladda “Tammy” Duckworth did not give a room full of men, including a couple of generals and a legislator from her state of Illinois, any time to feel sorry for her when she was promoted to major on Dec. 21 at the Walter Reed Army Medical Center. The lady in the wheelchair was too busy swapping stories about flying helicopters, asking about her outfit’s 300 or so Soldiers still serving in Iraq, and making her point that she plans to continue serving this country. There was no chance for anyone to lament the fact that most of her two legs are missing and that her severely damaged right arm was encased in a hinged splint.